The VANS UKSA National Skateboarding Championships 2013 is happening at Flo Skateparks in Nottingham on the Sat / Sun 19th/20th of October. This is a new venue and it looks to be pretty rad, it’s right near the centre of Nottingham making it easy for hotels etc. 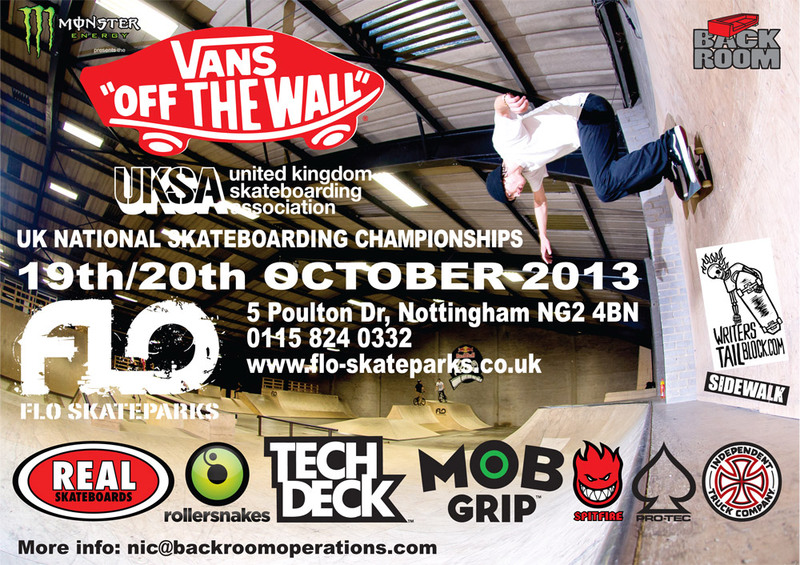 Volcom are also putting some bands on at the park on Friday night to make a weekend of it. 2pm – 8pm Qualifiers and some kind of stupid Writerstailblock comp if me and Ed come up with something. Park opens 10am. Pro Semis 2pm, Girls jam 3.30pm Finals/Best Trick 4.30-6pm. Prize Giving. To just come down, hang out, skate the bowl/mini etc is £10 all weekend, you’ll be able to skate the street course when the comp isn’t on too.